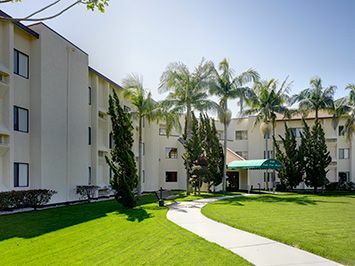 South Park Manor is a three story 126-unit secure apartment community, located near the civic center in the city of Gardena. The location of the building is very convenient for daily lives of our residents. There are several banks, restaurants, supermarkets, medical facilities, libraries, police and fire departments, and a post office-- all within walking distance. South Park Manor Co-op Apartments does not allow smoking in any common areas, and within 25 feet of the building. South Park Manor has a quiet, rural atmosphere and is surrounded by a recreational park. In addition, the city bus route is only five minutes walking distance from the building. South Park Manor is a beautiful four-wing building surrounded by lawn and a shaded patio with tables. We also have individual garden plots where residents enjoy vegetable gardening throughout the year. Our sister building, Meadowlark Manor Co-op, is just located on the other side of the fence. South Park Manor was also nationally recognized as “A Community of Quality” by the National Affordable Housing Management Association in 2011. This is a great place to live; you can be active and join committees and you have a say in how the co-op operates. Southpark Manor Co-op is proud to be recognized as a NAHMA Communities of Quality Corporate Partner. This designation is for multifamily properties that have achieved a high standard of excellence in the way they are managed, the services they provide residents, the experience and training of personnel, and other criteria.